Courage is not assertion without fear. Courage is assertion in spite of fear and comes in many forms, shapes, and sizes. I was reminded of this a few days ago while having a conversation. The individual I was speaking with was making jokes after receiving yet another round of chemotherapy. Because this person is incredibly private and humble, and would be embarrassed by my words, I will respect their wishes of privacy and not use their name. Their life on the other hand is one to share. You see this is the kind of person who creates safe spaces with his presence. Children and dogs love him because they instinctively know they are secure and protected. This is the kind of person who enlisted in the Army at seventeen and became a medic. Always looking out for others. He owned businesses, raised a family, loves his children, grandchildren, and of course his wife. He’d give you the shirt off his back, the money from his pocket, and has done so time and time again. Yes my fellow American I am picking up what you are putting down. He’d tell you that he isn’t special (he is) rather he is lucky. Lucky to be a citizen of the greatest country ever. Lucky to have had 69 years (and counting) on this Earth. He sees his exhaustion, nausea, dizziness, and pain as a good sign that the chemo is working. Not one complaint, not one bitter word, not a scintilla of why me? Although he doesn’t eat sugar, and his appetite has almost disappeared, he still makes birthday cakes for loved ones. The reason I am telling this story is to show the strength of the human spirit. The strength of one man unwilling to bend. In boxing terms he bit down on his mouthpiece and lunged forward firing with both fists. Cancer has no idea but it doesn’t have a chance. It picked the wrong guy. We have our own cancer in America these days. It’s called liberalism. It has overtaken the Democratic Party and done a pretty good job infiltrating the Republican Party as well. Standing in front of America is a 69 year old man whose body is being filled with drugs aimed at killing the cancer. Dizzy, nauseous, and exhausted he stands at the ready to make sure we do “what needs to be done”. He’s also a man filled with knowledge. In other words he voted for Trump. It’s time to bite down on the mouthpiece and lunge forward. 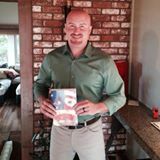 Tagged America First American Only, Freedom First Freedom Only, jason kraus, Jason Kraus Late Bird, jason kraus writer, One voice at a time, Shoulder to Shoulder, Trump. Bookmark the permalink. Thank you my friend. I will pass on your well wishes. Yes we do. We need more people like your friend!